Now that it’s autumn the shops are filling up with piles of pumpkins. I’ve been reading Easy Pumpkin Carving by Colleen Dorsey to help me make my Halloween decorations extra special! Easy Pumpkin Carving starts by explaining the different types of pumpkin and how different designs are suited to these types. There is a section on how to use carving tools and paper patterns to make it easy to carve your design. As well as traditional pumpkin carving, there are introductions to etching and embellishing designs, making pumpkin luminaries and using multiple pumpkins to create fun sculptures. In the back there are also a number of patterns which you can copy and use to carve your pumpkin. I bought a medium sized pumpkin and treated myself to a carving set to go with it. The little knife and plastic scoop made it so easy to prepare the pumpkin. After looking through the patterns in the back of the book, I picked a cute little ghost saying ‘Boo’!. Next I traced the design onto paper, taping it onto the pumpkin and using the pointy tool to outline the shapes. Lastly I used the little knife to cut out the shapes made by the pointy tool. I never would have come up with this design myself and there are so many unique ideas in the book. I especially like incorporating words into the pumpkin design. It would be fun to try adding your house number to a pumpkin that would be going outside your front door. Is this the best pumpkin I have ever carved? Yes! 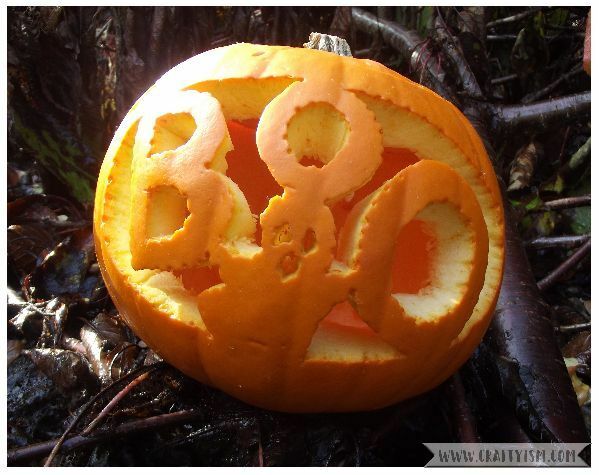 I love this design and using the carving tools and tips in Easy Pumpkin Carving, made it so quick to do. Unfortunately it didn’t last too long. Colleen Dorsey recommends covering the inside of the pumpkin with Vaseline to preserve it. I’ll definitely try this next time. Easy Pumpkin Carving is a great little book if you want to try something different with your pumpkins this year. There are so many unique ideas that your house is sure to be the spookiest on the street. So creative and cute rather than scary is good for little trick or treaters.